On July 30, 2016, Luke Aikins, age 42, became the first person ever to attempt a skydive with neither a parachute nor a wingsuit, and this feat was broadcast live on Fox. Mr. Aikins began his dive at an altitude of 25,000 feet, just 4,000 feet short of the summit of Mount Everest. Viewers watched him plummet, legs and arms spread, stomach down. Around 18,000 feet, he removed his oxygen mask and passed it to one of the three parachuted assistants diving with him. He aimed for the center of a 10,000 sq ft net, guided by GPS and lights. Seconds before impact, he flipped onto his back and landed safely in the California desert. 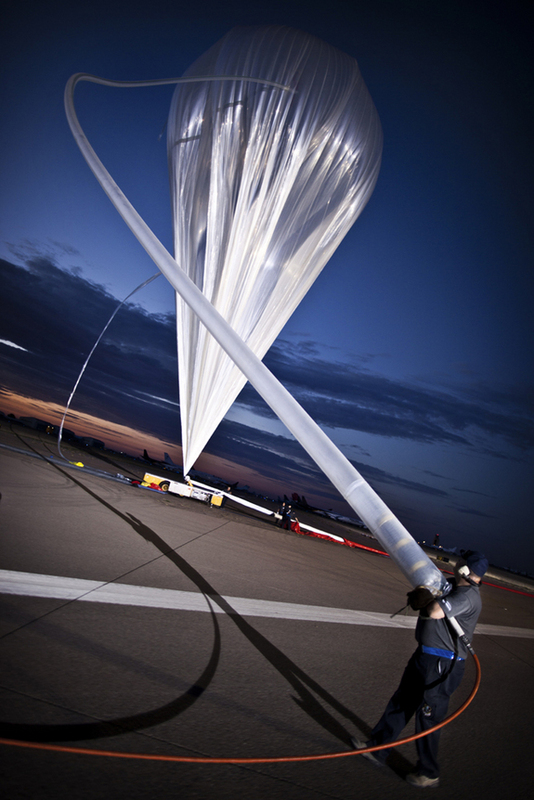 Aikins had been the backup jumper in 2012 when Felix Baumgartner became the first skydiver to break the speed of sound during a jump from 24 miles above Earth. He has made 18,000 skydiving jumps since he was 16. Below is an interview of Aikins explaining his jump before he did it. Aikins was able hit the net with pinpoint precision thanks to GPS alerts in his helmet and a sophisticated lighting setup on the ground that was visible from more than 25,000 feet up. If Aikins veered off course the lights appeared red, but when he was on target they shone bright white. Aikins was able to alter his course with just the slightest adjustments of his hands, because experienced skydivers have “incredible control” over where they land. Here is an article with more pictures. 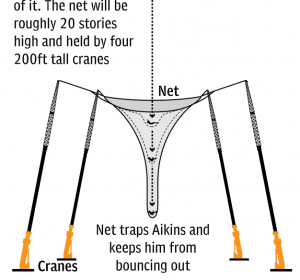 Aikins said that the net IS his parachute. It’s just that it is below him, rather than above him. Helluva trick! Want to go for a little ride??? Yesterday was my 74th birthday. I sat around the house enjoying family and friends. It snowed, I ate poached salmon and wine and carrot cake. Very sweet. Buttttttttt….. 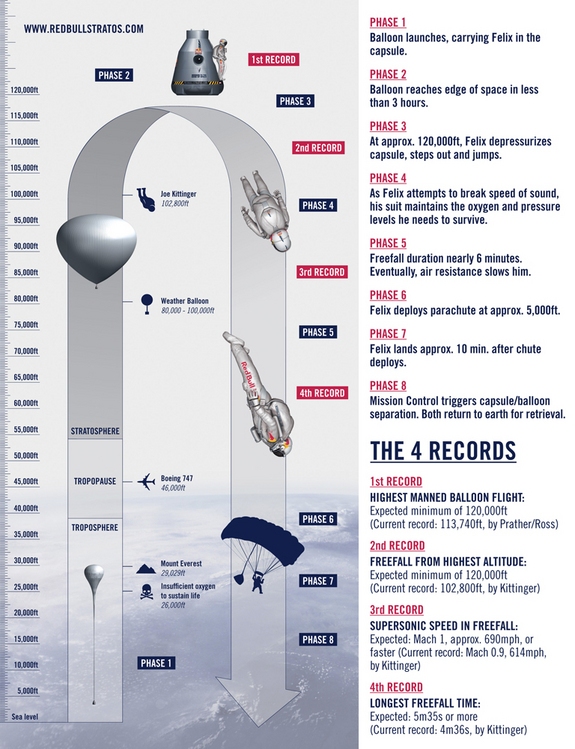 Here is a well-done animation of an upcoming, record-breaking attempt on October 8th: Felix Baumgartner is going to jump out of balloon from 120,000 feet (nearly 23 miles). If everything works out, this Austrian skydiving daredevil will shatter the marks for highest jump, fastest freefall, longest-duration freefall and highest manned balloon flight. He will also become the first skydiver to break the sound barrier. You can read more about it here. Baumgartner said he is nervous about Monday’s (October 8th, 8 am EDT) leap from the stratosphere. But the 43-year-old—who has jumped from some of the world’s tallest buildings and soared across the English Channel in freefall using a carbon wing—regards a tinge of fear as a good thing. The pictures are from a test flight this past July in which Felix jumped from “just” 18 miles. You can learn more about the actual jump here and follow it live with 35 cameras. Pretty exciting!